As a Christian mom, you strive to raise your children in a world of constant change, with God's wisdom as your constant guidepost. But when you are pulled in many different directions, sometimes you feel depleted. With Inkspirations Fruit of the Spirit for Moms, you can restore and renew your spirit by spending creative, reflective time with God. Artist Lorrie Bennett's bold distinctive art is paired with powerful scriptures, chosen especially for moms, to help you rise above life's challenges and celebrate its joys with your family. From maintaining faith in hard times ('God is within her; she will not fall.' --Psalm 46:5); to having patience in God's timing ('Blessed is she who believed that the Lord would fulfill His promises to her.' --Luke 1:45), to being kind and compassionate ('Do justly, Love mercy, Walk humbly.' --Micah 6:8). One of the greatest honors and callings in life is to be a mom. To nurture, to guide, and to give our children wings to fly. However, between the laundry and lacrosse practice, the carpool and community service, it can be a challenge be the embodiment of calm, grace, patience, and other fruits of the spirit. Whether you're scrambling to get your toddler to preschool or your teenager to prom, it's important to take some time out each day or week for yourself—to refill your well and renew your spirit. It's only when you care for yourself that you can care for others. Coloring is a perfect way to unwind. For a few restorative minutes, you can leave your worries behind while unleashing the creative gifts that God has given you. Artist Lorrie Bennett designed the illustrations in this book to complement timeless scriptural lessons so you can relax and reflect on God's Word, allowing His truths to calm your mind and feed your spirit. Each verse reminds us how acts of kindness and selflessness can make a difference, not only in our lives, but in the lives of others. Each day is a gift from God, a blank canvas on which to make our mark. If we can paint each day from a palette filled with love and compassion, we can make each day brighter for ourselves and for those we love. As you fill these pages with beautiful colors and patterns, it is our hope that you feel inspired and renewed, and that you reap the many blessings that come when you walk an inspired path. Happy coloring! Coloring is supposed to be a stress-free, no-worries kind of activity. There really is no right or wrong way to do it. But for anyone who wants to take it to the next level, here are some tips. PREVENT BLEED-THROUGH: Add a piece of scrap paper under each page you're working on to make sure that the ink doesn't bleed through the page. The colors on the top half of the wheel are considered the warmer colors whereas the bottom hues are the cooler ones. Colors that fall opposite of one another on the wheel are complementary, and the ones that fall next to each other are analogous. You can use both complementary and analogous colors to make a gorgeous piece of art—the possibilities are as endless as your imagination. ©2017 HCI Books. All rights reserved. 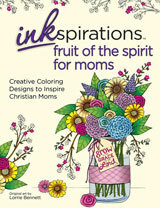 Reprinted from Inkspirations Fruit of the Spirit for Moms: Creative Coloring Designs to Inspire Christian Moms. No part of this publication may be reproduced, stored in a retrieval system or transmitted in any form or by any means, without the written permission of the publisher. Publisher: Health Communications, Inc., 3201 SW 15th Street, Deerfield Beach, FL 33442.
and beauty that it can bring to others.